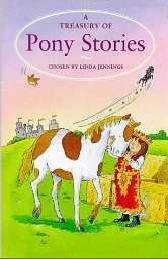 There is quite a good selection of British collections for the short story enthusiast with lots of stories by very well-known pony authors. The Pullein-Thompsons in particular wrote quite a few short stories and published a few collections, some with stories by other authors included. This section is concentrated upon short story collections by various authors. For collections by single authors please visit the specific authors' web pages. The Short Stories home page lists links to all the authors on the web site who have written collections of short stories. 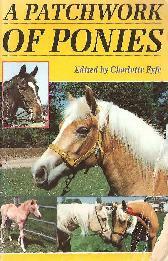 Also please visit the Pony Annuals page to find out about short stories in the various horse and pony annuals. Below are some of the short story collections I have researched in alphabetical title order. If I actually own the title I have listed all the stories with a short precis and perhaps a rating. If not, I have provided a brief overview. There are also links to the authors if they already have their own page on the website. This section will be constantly evolving as I add more, if you have any short story collections not included here please let me know so I can add them. American short story collections have their own page, and I will also be adding an Australian section in time. Reprinted by original publisher a number of times in hardback. 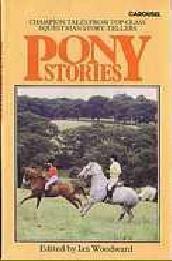 SUMMARY: A substantial book of animal stories which is mainly biased towards pony stories, including one by K M Peyton which I have never seen elsewhere. An extra bonus is a dog story by pony book stalwart Judith M. Berrisford. Proper stories, not excerpts, and of a fairly high overall standard. SUMMARY: A new rider appears at Clearwater Riiding Stables and things start to change…. SUMMARY: School pony story. Trudie's idea that her school should adopt one of the retired pit ponies is thought a good one by her teachers. But someone has other ideas and Trudie ends up in trouble…. SUMMARY: Beth wants to buy an ex point-to-pointer. SUMMARY: A lonely girl who doesn't fit in with the rest of her family feels an affinity for a wild colt. SUMMARY: Fantasy. A young Indian boy is too poor to have a pony of his own so he makes one from clay. SUMMARY: Adventure story. Penny finds a stolen horse and stumbles on a dastardly plot! SUMMARY: Zebra story set in Africa. Frances and her brother rescue a baby zebra. SUMMARY: Ranching story. Liza wants to prove she is as good a rider as her brothers. SUMMARY: Ruth longs to start riding. But her elder sister who is her guardian forbids her. SUMMARY: Janet hated having to learn shorthand but it came in unexpectedly useful when her pony was ill. Fairly easy to find in the UK through internet booksellers. Much harder elsewhere. 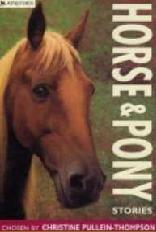 SUMMARY: Mixture of stories, some by Christine and sister Josephine, plus other top pony authors. 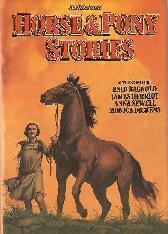 Most are proper stories, with only two being excerpts, though some were previously published elsewhere. SUMMARY: Paul is saving up to buy a pony but it looks like it will take some time. When a friend's mare gets lost in a blizzard and has a foal, Paul goes to the birthplace of the foal to make a wish as instructed by an old countryman and finds something very surprising there…. SUMMARY: The story of how a circus pony ends up in a horse sanctuary. Easy to find in the UK and usually cheap. Can be harder elsewhere. SUMMARY: Nice little book with some superior stories including some by Christine and sister Josephine, plus other top pony authors. 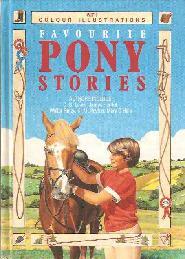 All are proper stories, no excerpts, though some were previously published in pony annuals. SUMMARY: Very well-written racing story. Has Billy got what it takes to follow in the footsteps of his dead father, a top jockey? SUMMARY: A girl, her horse Tam, and dog Ajax must undertake a perilous escape route to avoid a bushfire. Unfortunately the illustrator of the story in the Pan paperback has drawn the main character as a boy! SUMMARY: Humourous pony-point-of-view story. At a pony club camp, the ponies there discuss the various merits and faults of their riders. Two of them decide to persuade their riders to swap mounts, but results are not what they expect! SUMMARY: Set in Australia. A wrangler must try and break in the son of a rogue mare and a brumby stallion. SUMMARY: Humourous account of how a man becomes the proud owner of a racehorse. SUMMARY: A welsh pony tells his life story…. 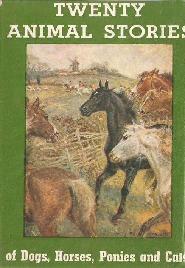 SUMMARY: The escapades of a characterful horse called George. May be a true story? 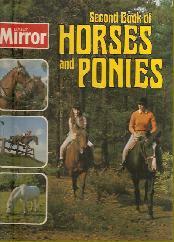 SUMMARY: Two girls worry that a bad-tempered farmer will turn their ponies out of their field. Easy to find in the UK and usually cheap. Can be a lot harder elsewhere. 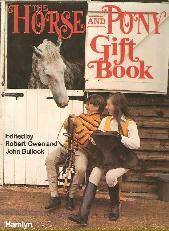 SUMMARY: An annual type horse book. Contains a number of non-fictional articles with two short stories. SUMMARY: Julie is annoyed when she hears her cousin Peter is coming to stay for the summer holidays. She has been told he has an expensive pony with which he wins everything at all the shows and is sure that his boasting will spoil the lovely rides she had planned with her homely but loveable pony Fluffy. But when Peter and his beautiful pony Portia arrive she finds that she couldn't have been more wrong about her cousin and it is up to herself and Fluffy to help Peter. SUMMARY: Twins Vicky and Lyn win a pony in a raffle but he turns out to be far from the horse of their dreams - can they make something of him? Fairly hard to find, although not usually too expensive. Revised edition published in 1987 and reprinted in 1989. SUMMARY: Mainly excerpts with a sprinkling of short stories. Illustrated with black and white drawings and some colour plates. Some of the excerpts are from unlikely sources which gives the book added interest. The short stories are mainly quite good. There is also quite a lot of content from adult books so it is suitable for a wide range of ages. SUMMARY: A story about a tribe of Cheyenne Indians and their horses. SUMMARY: Silas loves horses but the nearest he gets to them is riding the horses on the carousel at the fair which comes to town once a year. When he rides his favourite, the black Pegasus, he imagines he is riding a real horse. When the roundabout is scrapped, Silas sets out to find where it is stored to see his beloved Pegasus for one last time, not realising he is in for a magical surprise. A well written story with a fantasy element. SUMMARY: Girl guide/pony story. 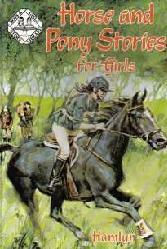 Polly and her cousin Linda discover a wild pony in the forest when on a guiding exercise. When searching for the pony one night they get involved with deer poachers and an adventure which leads to a wonderful conclusion. SUMMARY: Humourous adult story from the well-known 19th century French author. A man's boastful claims about his riding prowess leads to unforeseen - and costly - consequences. Revised from original text. SUMMARY: A story about Pegasus from the respected author. Easy to find in the UK and usually cheap. Can also be found in America, although it may possibly be cheaper to buy copies from UK sellers on Amazon. 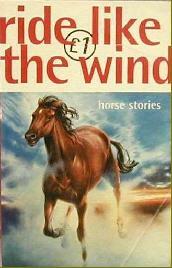 SUMMARY: A bit of a mixed bag which contains about an equal amount of horse and dog stories. A few extracts including the ubiquitous Black Beauty, plus a couple of classics you would not normally associate with ponies. However the bulk of the book is taken up by proper short stories which are mainly of good quality. The highlight is the Monica Edwards story. (Originally published in THE PONY CLUB ANNUAL NO. 6 in 1995. 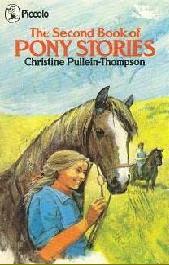 It was also included in CHRISTINE PULLEIN-THOMPSON'S BOOKOF PONY STORIES (see above). SUMMARY: Betsy, a lonely girl separated from her parents takes to 'The Slugnheart' an ugly stubborn roan pony owned by a neighbouring family. His owner thinks he is useless and that anyone who can ride the horse in a figure of eight and jump him can have him. Armed only with a book, Betsy, who has never ridden before, sets out to train him…A nice little story but highly unlikely! SUMMARY: A troublesome army horse with an evil reputation is rehabilitated. SUMMARY: Miranda is horse-mad but her father thinks that all horsy people are bores and refuses to let her have her own pony. SUMMARY: A milkman's horse proves his intelligence when his master is injured. SUMMARY: Humourous adult story from the well-known 19th century French author. A man's boastful claims about his riding prowess leads to unforeseen - and costly - consequences. Still in print in the UK although I think new copies are only available from the publishers, Cavalier Books. Second hand copies are reasonably easy to find on the internet also. Elsewhere, the book is harder to find but not completely impossible. SUMMARY: Large format book, similar in style to a pony annual but with more pages. Mainly non-fictional articles but also includes 4 short stories. The articles are for the most part fairly basic horse care stuff but there are a few more interesting snippets. The stories are all proper stories not excerpts and are of fairly good quality. SUMMARY: Peter persuades his father to rescue an injured grey ponies from some gypsies who were going to have him put down. SUMMARY: Joanna's parents are perplexed when she wants a Shetland pony as she is too big to ride him. SUMMARY: Jenny and her pony Caesar go to stay at her horsy aunts and her shaggy roman-nosed pony is overshadowed by all the expensive well-bred animals there. But are looks really that important? SUMMARY: A piebald gypsy pony is left behind when they move on and needs a home. Can the Twala Club step in? Although not common, it can be found without too much trouble on the internet and is usually not expensive. Harder to find elsewhere, although copies can be found in the USA. Reprinted in hardback in 1985. Substantial book, with lots of excerpts and a few of stories, most of which are good. Lots of adult stories too, making it more suitable for older readers. Some of the excerpts are from non-fiction books. SUMMARY: Excellent racing story about a lad who is tempted to nobble a racehorse. Great twist at the end. SUMMARY: Adult ghost story set against a hunting backdrop. SUMMARY: Humorous adult racing/betting story from the famous American crime writer. Perhaps a little hard to follow for younger readers and those who don't know betting terms. SUMMARY: A classic short detective story and a very good read. The inimitable Sherlock Holmes investigates the disappearance of a race horse. Reprinted in paperback in 1994 and then subsequently with different covers in 1997 and 2003. SUMMARY: Gorgeous illustrations by Victor Ambrus, but otherwise not a wholly great offering. Most of the stories are excerpts from novels. 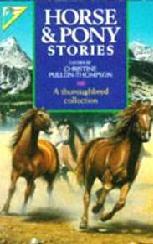 Of the few proper stories, two are by the PTs and can both be found in their own collected short story edition, The Pullein-Thompson Treasury of Horse and Pony Stories. However, what little stories there are, are of a high quality and include some by celebrated authors, although perhaps they are more suited to older children and adults than younger readers. The low rating is for the overall book and takes into account the large percentage of excerpts rather than the quality of the few full stories contained within. SUMMARY: A re-telling of the Greek myth of the legendary winged horse Pegasus and Bellerophon. SUMMARY: Historical story set in Elizabethan times. A performing horse and his master are suspected of witchcraft. Can the horse's skill save them both from being burnt at the stake? A good short read. SUMMARY: Mark's riding leaves something to be desired, until a ghostly riding instructor appears to help him! OH COBWEB HOW COULD YOU? SUMMARY: When Cobweb inexplicably loses form, spoilt rich Fiona wants rid of her. But surprises are in store all round. SUMMARY: Funny story by one of the masters of the short story. The Mullet family have been trying to get rid of a rogue horse for years. When Toby Mullet does finally sell him to a new rich neighbour, his mother is horrified, as she is hoping to marry off one of her daughters to the newcomer and worries the horse may kill him first! Good read for adults. This was reprinted a number of times, some editions have different covers, and some internet sellers list the subtitle, others don't, so do make sure you check that you are not buying the same book twice! Easy to find in the UK. Some copies around in the USA also. Reprinted a number of times in hardback. SUMMARY: An excellent book of short stories; they are mainly of good quality, some are longish and, apart from one excerpt from Black Beauty, all are proper stories. 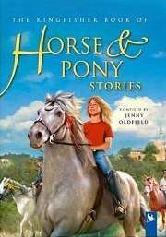 SUMMARY: Two girls find the place where they ride their ponies blocked by barbed wire when a new owner buys the land. It seems there will be no-where left for them to ride...until a bit of lateral thinking saves the day! SUMMARY: Adventure story set on Dartmoor. 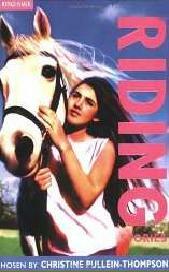 A girl out riding on the moors comes across an unconscious man and gets involved in a mystery. SUMMARY: A girl wants to follow in her jockey father's footsteps and compete in a point to point. A very long story. SUMMARY: When the family moves to a new house in the country, Elizabeth hopes that she will be able to ride. But her attempts to get close to the local ponies don't go well! A good humourous story. SUMMARY: Adventure. A girl goes to stay with her aunt in America and gets involved with the legend of a ghost horse. SUMMARY: Nobody expects shaggy little Bundle to win anything at the gymkhana, least of all his rider Jane…. Easy to find in the UK, quite a bit harder elsewhere. Reprinted in paperback in 2006. SUMMARY: Book of proper short stories with two by the editor Jenny Oldfield. Stories are for the most part good quality and there is a very good mix of settings, from different places and historical periods. Its also a very attractive book, being large and glossy with full colour illustrations throughout. Mainly lesser known authors, apart from Ms. Oldfield, Pamela Kavanagh is probably the most well known. SUMMARY: USA set ranching story. Old ranch-hand Sam doesn't approve when his boss take his young daughter out with him on a cattle drive, but the dramatic and tragic events on the drive bring the pair closer together. SUMMARY: Set in the Spanish Riding School of Vienna. Two rival pupils at the school try to prove themselves. Interesting detail of haute ecole but story is a bit dull. SUMMARY: Re-working of the legend of the meeting of Alexander and Bucephalus. SUMMARY: Rather odd fantasy story about a merry go round horse that comes to life. SUMMARY: Heart-warming story about a girl who loves the stables where she learns to ride, especially the first ever pony she rode, Shetland Ben. However when the stables have to close she must make a choice which could mean never seeing Ben again…. 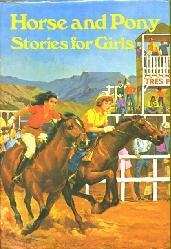 SUMMARY: A girl and her new step-sister learn to get a long with the help of a horse. SUMMARY: Set in medieval Japan. The daughter of a famous breeder of war horses has a special bond with the former war horse Inkblack who is now used for breeding. But when an important General's horse goes lame, her father offers Inkblack to him as his mount. SUMMARY: Set in France. Chantal has lost her nerve after falling from her pony. 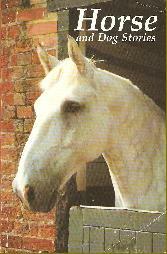 When she rescues a small Romany child, she is drawn into the world of the Romanies and the beautiful grey mare Mistral. But she knows she will never have the nerve to ride her. Nice to see a story with gypsies as the good guys! 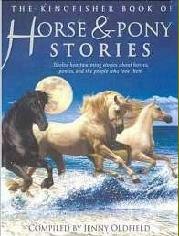 SUMMARY: Heartwarming fantasy story about a magical chalk horse and an old grey pony. SUMMARY: Australian set story. Abi and Red are hopefuls for the Olympic eventing team, but in the trials a freak accident - or is it sabotage - threatens their chances. Can the pair's bond overcome this obstacle? Easy to find. Still in print and can be bought new in both the UK and USA. SUMMARY: Mixture of stories, non-fiction, quizzes. Poems etc. Could do with more stories and less odds and ends. One pretty good story and a couple of the excerpts are from lesser known books. SUMMARY: Fiona helps her widowed mother run a small market gardening business. Their cob Billy is essential to help them do the work on the place and he is also Fiona's best friend. When Billy is injured it is a double tragedy for Fiona. Will he ever recover? A nice little story. SUMMARY: Horsy fairy tale from the classic children's author. Paperback original. Reasonably easy to find in the UK. Quite a bit harder elsewhere however. SUMMARY: Not much in the way of stories, quite a few factual articles, poems and other bits and bobs. A lot of the articles are now a bit dated, some are quite interesting. The book however is worth getting for the new Pony Patrol story which I don't think was ever published elsewhere. SUMMARY: Short story addition to the Pony Patrol series. 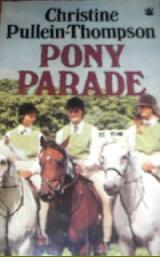 The Patrol try to stop a horse-drawn caravan holiday scheme in which the ponies pulling the caravans are ill-treated. Although not that common can be found on internet book shops and is usually cheap. Hard to find elsewhere. Reprinted by original publisher in 1973. SUMMARY: A book of 'bits and pieces' rather than a book of short stories. It actually only has one story, plus a few book excerpts - the rest are articles, quizzes, poems, etc. The highlight however is the excellent story by Monica Edwards and if you are a fan it will be worth getting for this alone. SUMMARY: Historical story set in the time of the English Civil War. Robin lives and works on his father's farm and the love of his life is a huge black horse called Barbarossa. But when his father's landlord Sir Robert Dudley spots the horse he wants it to use as a cavalry mount. The family know that if they refuse they could be turned out of their farm, so Robin comes up with a plan to trick Sir Robert and keep the horse. Easy to find in the UK and cheap. Harder to find elsewhere but not very expensive to buy from the UK and have shipped to other countries. SUMMARY: A book of 'bits and pieces' rather than a book of short stories. It actually only has one not very appealing story, plus a few book excerpts - the rest are articles, quizzes, poems, etc. 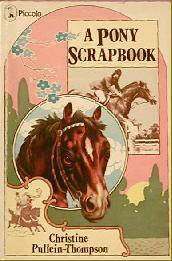 Not as good as the first Scrapbook which was graced with a top class short story. Unless you like quizzes and facts, not really worth a look for the short story lover. SUMMARY: Jonathan thinks too much of his own pleasure, and not enough of the needs of his elderly pony Seagull...leading to tragic consequences. PONYMAD VIEW: An unpleasant and tragic short story which is, considering the content,unbelievably followed by a 'quiz' type of affair with questions asking what Jonathan has done wrong. I see the reasoning behind this in instructing kids to think of their pony's needs before their own but it is done in an insensitive and clumsy manner that will be upsetting to many a young reader. PONYMAD RATING: HORSE DROPPING BOOBY PRIZE! Paperbacks only. Fairly easy to find in the UK. Harder to find elsewhere but not very expensive to buy from the UK and have shipped to other countries. Revised and reprinted by Carousel. SUMMARY: Collection of proper stories, no excerpts. Mainly by lesser known authors, but of a good quality. SUMMARY: A shy and timid girl's plan to make friends with a neighbouring child backfires. But when the neighbours are in danger she has the chance to make amends. SUMMARY: What is the mystery behind the behaviour of the beautiful but ill-tempered Arab circus horse? SUMMARY: Australian pony story. Kevin is determined to make the stray pony his own. SUMMARY: A prideful young lady who thinks she knows more about horses than all those around her finds herself in the wrong. SUMMARY: Racing story. When a wealthy trainer is fatally injured he makes a will leaving his fortune to whichever of his two young relatives - both jockeys - win the upcoming Linbury Cup. Greed causes one of the riders to resort to underhand tricks. SUMMARY: Tess would love to learn to ride but is terrified of horses. However when a stray and injured horse appears on the scene she must overcome her fear to help him. SUMMARY: Set in 19th century USA. A small boy is lost when his pony bolts, but he ends up helping the white men and Indians in the area come to an understanding. Fairly easy to find in the UK and usually quite cheap. Can be hard to find elsewhere, though can be inexpensive to buy from the UK and have shipped to other countries. 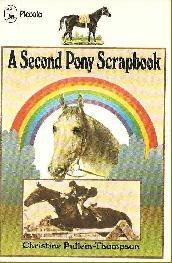 SUMMARY: Excellent little paperback produced by Pony Magazine. No excerpts, all proper stories including the only short story I know of by Patricia Leitch, as well as other well-known authors like CPT, Carol Vaughan and Rosemary Simmonds. SUMMARY: Two disparate children become friends despite their differences. SUMMARY: Very well written story. 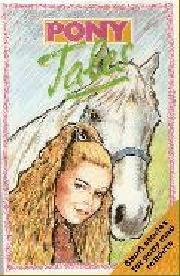 Kate longs for a life working with horses but fears she may be stuck forever on her parent's remote farm. Then she finds out her father has a shady past in the world of racing. When this past catches up with him again it brings something wonderful into Kate's life. SUMMARY: Jenny begins working at a stud but finds it harder to get along with one of the other workers than with the horses. SUMMARY: When Lucy returns to stay with her aunt she rushes off to see the horses she befriended on her last visit, but to her horror they have gone! SUMMARY: Can a real pony be as good as the dream pony Philippa is painting? SUMMARY: After a terrible tragedy, Valerie has lost her nerve. SUMMARY: Karen learns that working with horses isn't all she hoped it would be. SUMMARY: A tragedy occurs at a show and changes the life of two girls forever. Appears to in print at the moment and can be bought new from the UK. Harder to find elsewhere. SUMMARY: One of the more modern collections of stories. A small book which only contains 5 stories, but they are of a good standard and as far as I know they were all original stories for this compilation. SUMMARY: When Gerry's older sister Louise breaks her leg she pleads with Gerry to ride her thoroughbred Gothic in an upcoming event she has spent ages qualifying him for. But Gothic is temperamental and Gerry is more at home on her quiet gentle Welsh mare: how will she cope? SUMMARY: Sandy spends her holidays on a farm riding with her friend William. When her cousin Trish comes with her one year she thinks the holidays will be spoilt as Trish is boring and doesn't even like riding! But when William has an accident Trish proves she is of greater substance than they had thought. 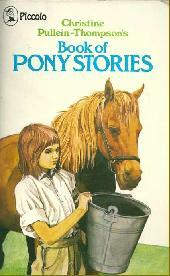 SUMMARY: A girl's new pony goes missing. But through this seeming disaster comes new understanding and friendship. Very easy to find in the UK. Can be a lot harder elsewhere however. 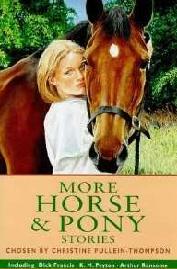 Reprinted in 1998 when it was re-titled MORE HORSE AND PONY STORIES. 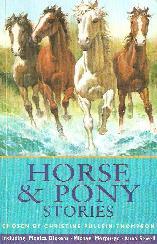 SUMMARY: A companion book to Horse and Pony Stories Chosen by CPT (see above) and very similar in that it has the lovely Ambrus illustrations, a number of classic authors, and again a high proportion of excerpts rather than full short stories. However this edition is a little better in that it has more full stories than the other and includes an excellent Patricia Leitch story plus one by DPT which I don't think was published elsewhere. Why do publishers keep changing titles when they republish? This is a question that springs to mind when looking at the publishing history of this book which has had three different titles! It is an annoying habit which can lead to people buying the same book more than once thinking they have found something new. But I digress! The book is easy to find in all its incarnations in the UK. The latest edition - Riding Stories - is in print at the moment and can be bought new. The book is also quite easy to find in the USA. Reprinted in hardback in 2003 and in paperback in 2005, 2008. 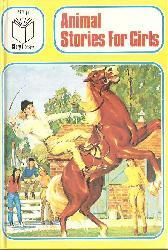 Later editions had 'Kingfisher' in the title. SUMMARY: All proper stories although seem aimed at a younger readership than the other compilations. Quite a few are by lesser known authors. 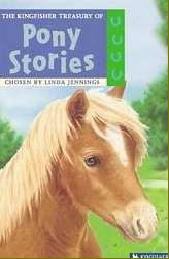 Not to be confused with the Kingfisher Book of Pony Stories which is edited by Jenny Oldfield! Easy to find in the UK and is still in print if you want to buy a new copy. Copies can also be found in the USA. Reprinted by original publisher a number of time in hardback. SUMMARY: Vintage book of animal stories. Lovely illustrations by various illustrators (not credited but appear to be by the originals). 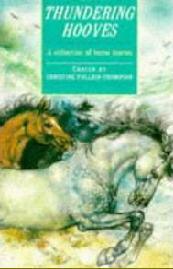 Some equine stories which are mainly of the excerpt variety, although, as many come from lesser known/rarer books, this book may be of more interest to the collector than the usual excerpt collection. Plus the bonus of some cat and dog stories. Reasonably easy to find in the UK. Prices tend to vary a lot so shop around. Can be harder elsewhere, though by no means impossible.